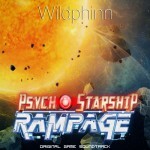 Wildphinn » First interview with Psycho Starship Rampage designers! First interview with Psycho Starship Rampage designers! Great news: the designers of Psycho Starship Rampage have given their first interview about the game! It’s in French, but if you do read our sweet language of cheese and wine, do pop here and learn all about the project’s inception and what makes it stand out from others! All glory to the rampage! Discover Psycho Starship Rampage through the press kit! Vote for Psycho Starship Rampage on Greenlight!